The Super Carrel was designed for ease of use by placing the controls and drive assembly close to the seated operator. Film loading/unloading is easier than ever. Focus and magnification levers are conveniently located for simple adjustment. The power switch and gear selector are also at theoperator’s fingertips. With all the controls and film loading conveniently located near the operator, persons with disabilities will find the Super Carrel very easy to use. No standing or excessive reaching is required. Operating instructions are conveniently located at eye level. 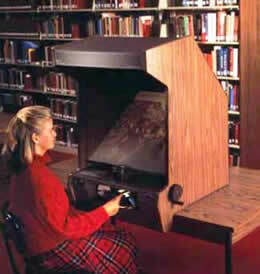 The Super Carrel reader is designed to last. Ultra hard alloy drive components, and super strong Delrin® gears, make the gear system is strong and reliable. Internal shafts are made from 1/4″ solid stainless steel. All formed cabinet panels are steel with a baked enamel finish for durability.